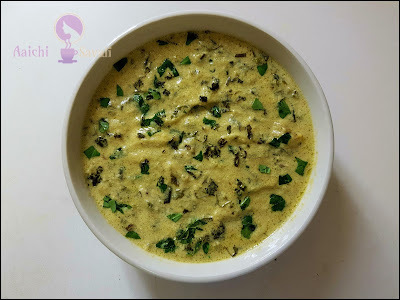 Methi Mutter Malai is an amazing curry recipe and which is loved by kids and adults equally. This dish looks so different than the rest of the other curries. It's very simple and easy to make. Basically, it's made from main three ingredients that are Fenugreek leaves (Methi), Green Peas(Matar) and Fresh Cream (Malai). This curry has a slightly sweet taste than other curries, so it's perfect for kids and who ate less spicy food, if you are looking for a mild spicy option in Indian curries then this can be the one. s down the rate of sugar absorption into the blood. So delight your family and friends by making this creamy textured Methi Mutter Malai. 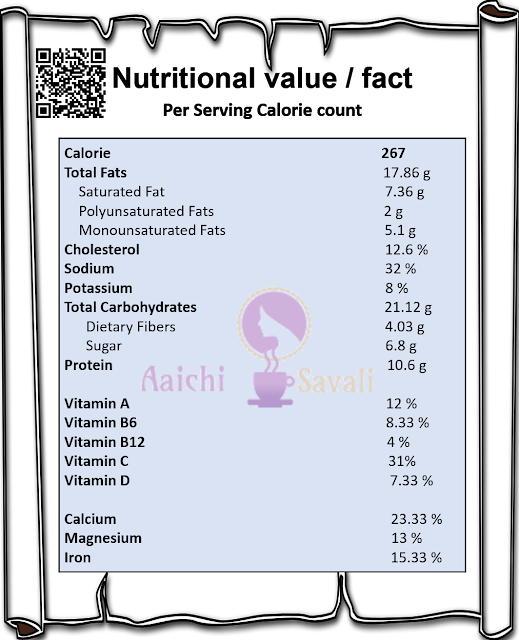 Each Serving of Methi Matar Malai Contains 267 Calories. Heat butter or veg.oil in the instant pot in sauté mode, once oil get hot add cumin seeds, black pepper, cloves, cinnamon, cardamom and bay leaf and let it splutter. Now, add boiled onions paste and green chillies and ginger-garlic paste. Sauté for about 3 to 4 minutes. 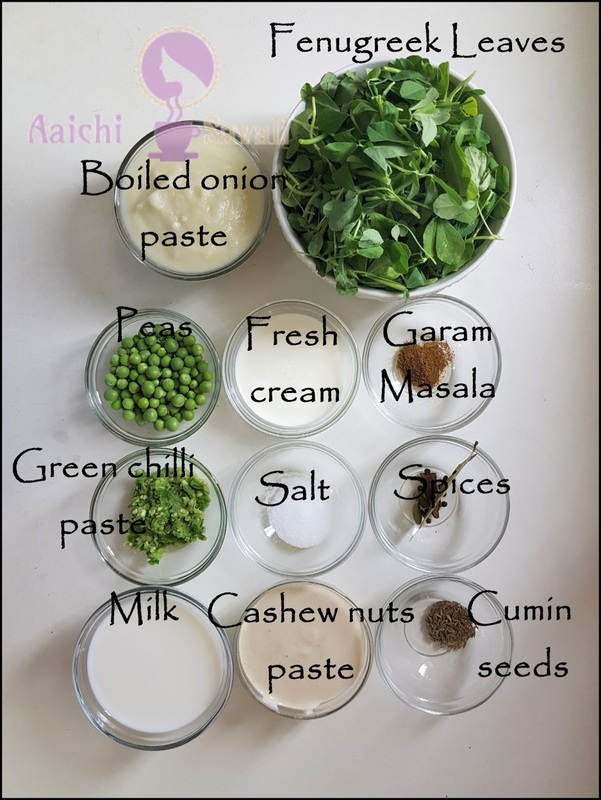 Add cashews paste, garam masala, salt, green peas, fenugreek leaves to the instant pot, mix all well and saute for 2 to 3 minutes. Add, milk and milk cream and mix the ingredients. Stir well. If needed, add water to get the desired consistency. Garnish with kasuri methi. 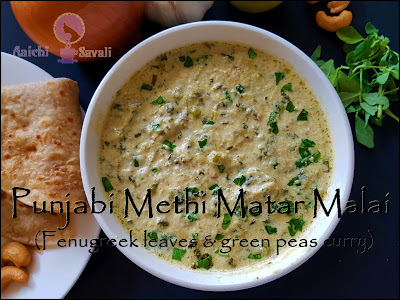 Methi Mutter Malai is ready to serve, serve hot with rotis, chapatis, naan or with rice. Enjoy!!! The quantity of cream in this recipe can be adjusted to taste and preference. To make a lower calorie version, I have used more milk and 2 tablespoon of cream. I have used fresh green peas, you can use frozen peas too, just boil them till they are soft and then add to the dish. Boiled onion will help you to reduce the raw taste of the onions, so I will recommend you to don't skip this step. 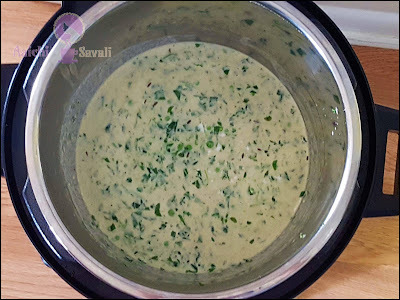 If you don't want to prepare in Instant Pot, no worries you can do all the procedure into the kadhai too! Just first cook methi leaves separately for 2 to 3 minutes in a boiling water, drain the water and chop them and then add them to the kadhai with Matar. 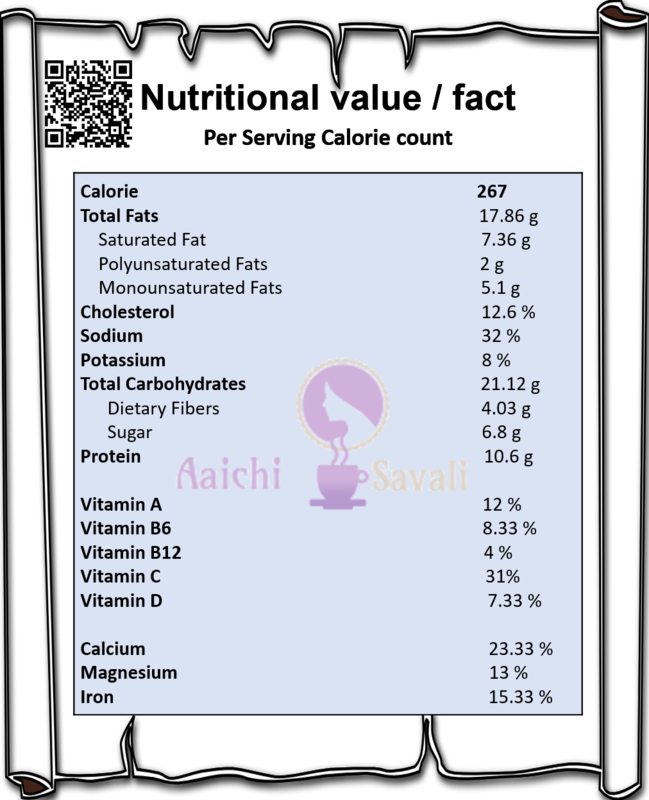 Per serving contains 267 calories, along with carbohydrates - 21.12 g, Dietary Fibers - 4.03 g, fats - 17.86 g, proteins - 10.6 g.
It's good to eat methi mutter malai for lunch. Yes Sattvik Aahar is always best. Here in this recipe to to get this curry thickness you can totally replace onion by adding khoya or mava. This will help you to get just like this creamy texture. HOW CAN I ADD PIQUANCY TO HARYALI METHI (PUNJAB) SAUCE? I LIKE IT REALLY HOT SO DO YOU SUGGEST GARLIC? CHILI FLAKES, CAYENNE??? 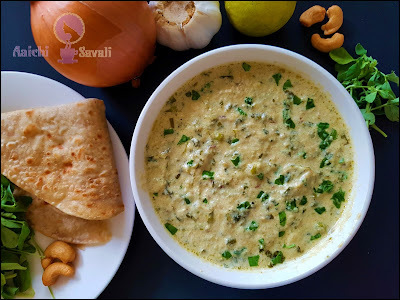 I don’t find coconut milk easily at shops, what’s the alternative of coconut milk to make authentic methi matar malai?